Better Angels is a supervillain roleplaying game created by Greg Stolze and published by Arc Dream Publishing. You can find information about it in the Arc Dream Publishing webpage. You can buy Better Angels from DriveThruRPG. A demon gave you superpowers and it demands evil. No, not just evil – EEEEVIL! In Better Angels, you play a supervillain attempting ridiculous acts of villainy in order to control the demon that gives you amazing powers – and you play the demon for the player next to you, pushing that player’s supervillain to greater and greater wickedness. Do too much evil and the demon might take control entirely. Too little, and – well, it’s a demon. It will find ways to punish you. Better Angels focuses on characters’ moral stances. Is your villain Insightful or Devious? Are you Cunning or Patient? Is your Courage as great as your Cruelty? Those characteristics drive your superpowers. They shape your relationship with your demon and are shaped by it in every scene. Get ready. There are diabolical inventions to create. Enemies and rivals to thwart. Plots and schemes to launch. AN ENTIRE WORLD TO CONQUER. All it will cost is your soul. That is an amazing introduction to the game. It touches the theme, the main elements and the overall mood. It is good enough to let me jump straight to creating a character. Or, more precisely, two characters: this game requires the creation to be done in group. In general terms, you spend points on your supervillain and then you spend points on the demon of the player seated to your right (the demon you will be controlling too). The player to your left defines and plays your demon. In every step, the costs are the same: a Tactic costs 1 point, a Specialty costs 2 points, and a Strategy costs 2 points. What are Tactics and Strategies and Specialties? Well, Tactics and Strategies are the main values of a supervillain. They are set in pairs of Sinister and Virtuous. To do things, you pair a Tactic and a Strategy. For example, you could use Sly Greed to empty someone’s pockets without him noticing. Specialties are for things most people don’t even know how to do. For example, open heart surgery, or bomb defusing. A character can’t have more than three specialties. Here I will be acting as two players, Adam and Brenda, both creating a character. Adam is thinking of creating a character inspired by a mix of Dr. Doom and Dr. Evil, while Brenda wants a more straightforward destroyer, like a hulking fireslinger. First, everyone gets 1 point in Open. It is needed to live. Then you spend 20 points to buy Tactics, Strategies and Specialties. The game recommends buying up specially each Virtuous Strategy to avoid starting the game under the thumb of the demon. The maximum for a Tactic or Strategy is 5, but you can not start with a Strategy higher than 4. Also, you can’t have more than seven points in a pairing of Strategies. If your Devious is 4, your maximum Insightful is 3. For your demon, you have to choose the primary drive, one of the Sinister Strategies which, if it ever reaches 5, allows the demon to try to drag you to hell (physically). Then you choose one of the powers the demon can give you. Powers are associated with Sinister Tactics, and need a high value to work better. Finally, you have to chose one Aspect. An Aspect is a temporal physical mutation that the demon can invoke, sometimes when you don’t want it. Aspects are linked to Sinister Strategies. If the value gets too low, you may not be able to invoke the Aspect. Adam chooses Cunning as his demon’s primary drive. For the power, he checks the list of powers by Tactic and picks Terror, a Cruelty power which allows him to scare others with a Devious Cruelty roll, striping away their Courage. Finally, for the aspect he chooses Cloven Hooves, an Aspect that allows him to make Faustian pacts: give a big bonus to someone, and later take a bit of its soul (in the form of a strategy point that gets to him in the form of a tactic point). Meanwhile, Brenda chooses Devious as primary drive for her demon. As a power, she is doubting between That Hideous Strength and Dominator Strike. 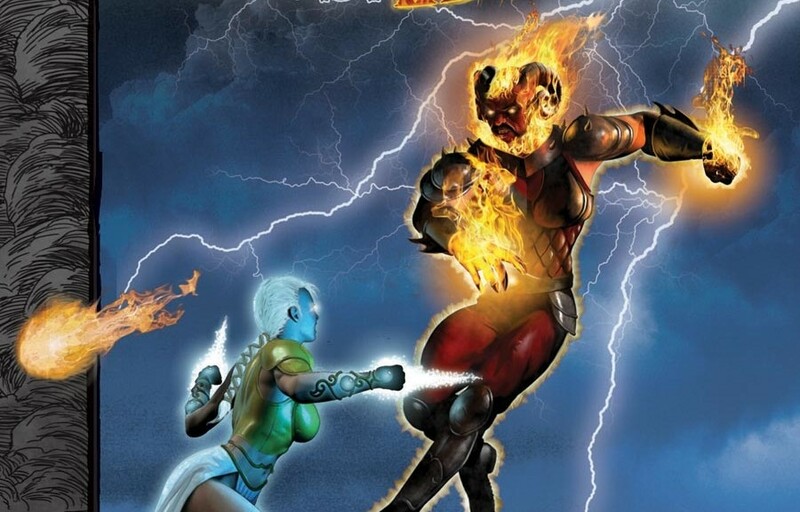 In the end, she prefers Dominator Strike (Hot), which allows her to launch bolts of hellfire using Sly Cruelty. Finally, as aspect she chooses Giant, which is great, as allows her to grow for each point in Sly, giving additionally the effects of That Hideous Strength. Now, every player gets to spend 20 points on the traits of the character to his or her right. And now everyone picks a power and an aspect for the character to his or her right’s demon. It is usually better to choose aspects and powers from the strategies and tactics you just raised, to make it easier to tempt the other character. Adam chooses Impossible Beauty (Corruption) as power and Flame-Wreathed (Devious) as aspect for Brenda’s character. Brenda chooses Arrogance (Cowardice) as power, and Wings (Cunning) as aspect for Adam’s character.